Follow Lara Croft down a path of discovery as she travels the globe to remote, exotic locales in search of one of history's greatest artifacts that unleashes unwelcome figures from Lara's mysterious past. With guns blazing, Lara must use her athletic ability and intellectual wits to explore vast, treacherous tombs, riddled with challenging puzzles and deadly traps. 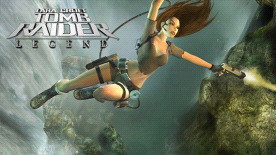 Experience an adrenaline-fueled adventure in Tomb Raider: Legend! Discover tombs and explore living breathing, lost ancient realms which hold clues to the secrets of Lara's past. Physics, water, and fire systems bring perilous environments of Lara's world alive, creating new deadly challenges and obstacles.